I’d probably wake up around 12pm. I’d then get freshened up, go and record some videos, or edit the ones from the day before. Hopefully get that done by 6pm, go to the gym or play football, and then the rest of the day is mine. I usually go to bed about 4am. And then it starts again. What do you enjoy most about being a CokeTV presenter? The fact that I would never have seen myself doing it. 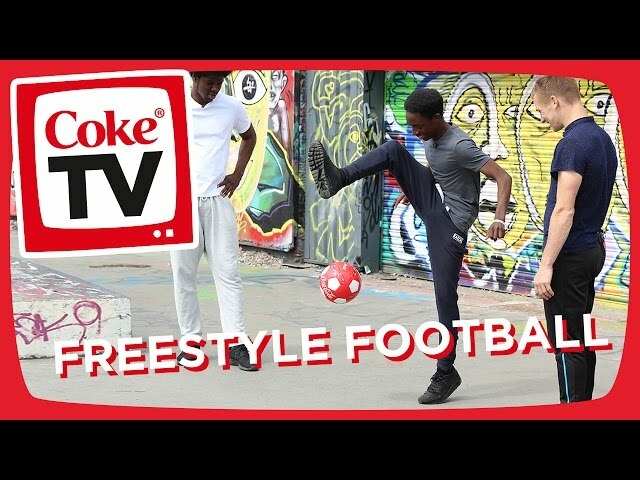 I always wanted to play football, but because I have my YouTube channel I’ve been able to adapt to the CokeTV job quite quickly. Also, trying new things. I might get the opportunity to fly a plane – when would I ever get the chance to do that!? "I’d love to jump out of a plane – safely, obviously. But my mum won’t let me!" What’s been your favourite episode so far? It’s going to sound a bit typical, but I really like the freestyle one, because I never knew I could pick up those skills so quickly. Have you learnt any new skills on the job? I’ve learnt how to compose myself a bit more in front of the camera. At home I have one light and it’s pretty simple. But in the studio there’s loads of lights. You have to forget that and look straight down the camera and do what you do at home basically. Can you tell us a behind-the-scenes secret? Secretly, what everyone doesn’t know is that I turn up to most of the shoots on three hours sleep! It would have to be Ronaldinho. He’s someone I’ve looked up to for a long time. Then Ronaldo. But I’m not sure how likely working with either of them is! What kind of episode would you like to film next? I’d love to jump out of a plane – safely, obviously. But my mum won’t let me! In your words, what makes a good video? Just raw entertainment. For me, on my channel, all the videos that have got over a million views or have done really well have been the really simple ones. Not high production or anything. I think it’s very important to make sure that the entertainment factor is there as well as the quality. Do you ever get noticed on the street? Sometimes. I went to eat out with my friends and these kids were sitting on the table behind us and one of them recognised me, then he started shaking. He went up to touch me to see if I was real, and I was like ‘of course!’ He said ‘oh my god I touched him’. "For me, on my channel, all the videos that have got over a million views or have done really well have been the really simple ones." Making. I don’t really watch YouTube videos that often. Unless I see something interesting on my timeline, or someone tells me to go and watch a video. I only follow a couple of channels, like nigahiga – one of the best YouTubers. He’s got about 18 million subscribers or something. I get asked this question a lot. I can only advise people based on how I’ve done it, and I can’t even do that because I don’t know how I’ve done it! So I say it depends on what you want, and how you want to be perceived. If you want to do it make sure money is not the motive, because you’ve got to enjoy what you do, because that’s the fun part. Unpredictable. Exciting. And very, very interesting. Read our interview with fellow CokeTV presenter Dodie.